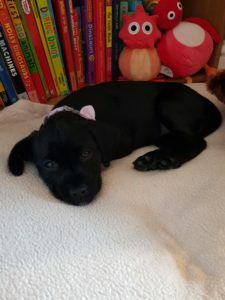 Meet Little Molly! The latest addition to our office dog clan. Mum Emma has been a member of the Buddies team for 4 years and has been looking to get a dog for quite a while. Emma wanted to wait until her boys, Archie and George were old enough to understand the responsibilities. 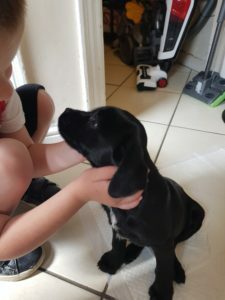 Little Molly is just 10 weeks old and is a Border Terrier cross Springer Spaniel (but has huge paws like a black Labrador!). 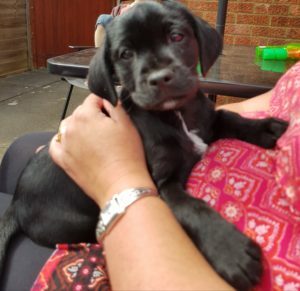 As our new recruit shares her name with our oldest office dog Mollie, we are referring to her as Little Molly, however we think she may grow to be much bigger than Mollie. 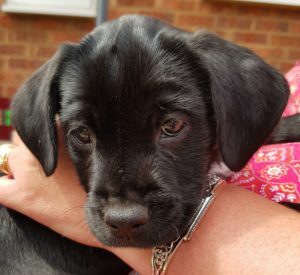 ‘We are still working on the toilet training, but she is doing well for her age.’ Says Emma. Little Molly likes to chase her big brothers round the garden and grab their trousers and have tug of war with them. Molly popped into the office this week for a few hours. We will be gradually introducing her to the team and other office dogs until she is confident enough to be added on to the office dog rota.